Ando and Kusenko studied images of the most powerful objects in the universe — supermassive black holes that emit high-energy radiation as they devour stars in distant galaxies — obtained by NASA's Fermi Gamma-ray Space Telescope. For more information about Kusenko's research, visit www.physics.ucla.edu/~kusenko/. 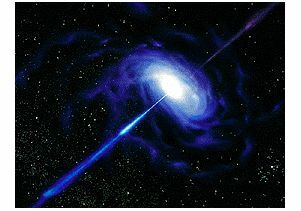 NASA artist's conception of an "active galactic nucleus"